Hodeg secures fifth win of his neo-pro season, whilst double stage winner Bennett loses leadout man to finish fourth. Álvaro José Hodeg (Quick-Step Floors) took a rough bunch sprint, edging out John Degenkolb (Trek-Segafredo) and Nathan Haas (Katusha), second and third respectively. Andrey Lutsenko (Astana) finished safely in the bunch to retain his overall race lead, though Haas and Deigo Ulissi are only four seconds down on GC with one stage remaining. 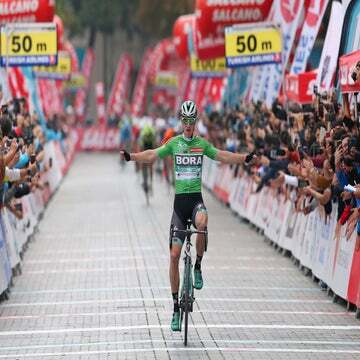 “Every victory is special, but this is really something, because it came in my last race of the year and I am happy I could repay the squad for the trust they put in me,” Hodeg said. 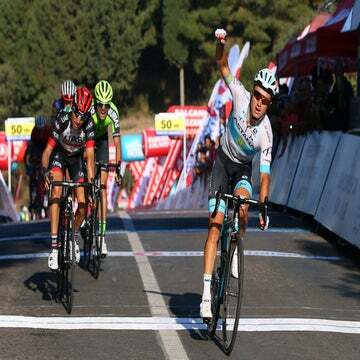 In a 137.7 kilometer stage earmarked for the sprinters, a five-man break formed early on, comprised of Amaro Antunes (CCC), Rafael Reis (Caja Rural), Nikolay Trusov (Gazprom-Rusvelo), Aime De Gendt (Sport Vlaanderen- Baloise) and Onur Balkan (Turkey). However, the sprinter’s teams kept them close, with the leaders only gaining 2:35 by the halfway point of the race before the gap started tumbling. With 5.8km remaining, the gap to the break had fallen to 15 seconds, with Bora-Hansgrohe and Quick-Step Floors driving the pace for double stage winner Sam Bennett and Hodeg respectively. However, Bora-Hansgrohe lost key leadout man Matteo Pelucchi in the final kilometers to a crash, significantly denting Bennett’s chances. On the wide final straight, Bora-Hansgrohe and Quick-Step Floors jostled for position, with shoulders bumping frequently. However, the Belgian team’s Max Richese led out Hodeg to perfection for the win, with Degenkolb and Haas surging strongly in the final to secure their podium spots. The victory marks the fifth for the Colombian Hodeg in his neo-pro season, and his team’s 71st of the year.